Rockefeller College is a tight-knit community of students, staff and faculty; we hope that it is a place you can call home, and where you engage in an exceptional journey of intellectual and personal growth. As a member of Rocky College you will share meals with friends and faculty in the Rocky Dining Hall (which is the hub of our community) and you'll have the opportunity to participate in a myriad of activities; whether it's one of our wildly popular Tuesday night study breaks, a "take your professor to dinner" night, a trip to see a Broadway show, an intimate conversation with faculty members at a Friday Afternoon Tea, a workshop with Peer Academic Advisers, or a film screening in the Rocky/Mathey Theater, you will find Rocky is an active, entertaining, and culturally enriching community. 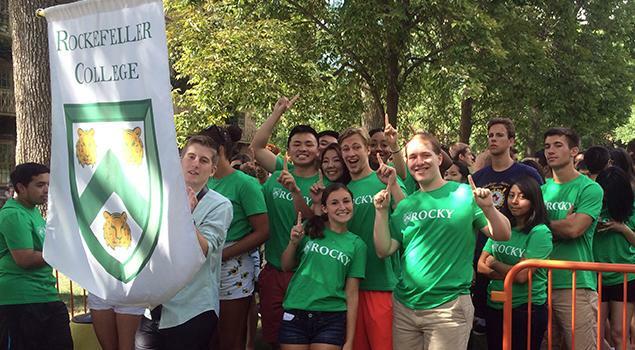 Rocky will also be the primary point of contact for your academic advising and support during your years at Princeton. Check out the links at left for more information!